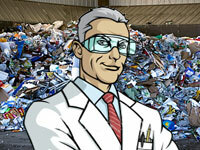 The Trash Doctor of Colorado has all the tools to get the job done right. We have an experienced local team that works with your individual junk removal needs and does everything to make the process easy on you. If you are located in Denver or surrounding areas, our team can remove your junk, trash and recyclables from any location on your property. We offer our junk removal and cleanup service for any scenario from single item pickups to business clean outs. No job is too big or small for us. Our friendly and knowledgeable uniformed team is the best in the industry. We’re a full-service junk and trash removal company that ensures that your junk and rubbish get recycled, donated or disposed of in the most green and environmentally friendly method. The entire process is simple and you have nothing to do as we take care of everything. We sort through your items and separate items to recycle, donate and dispose of responsibly. Then our team members will load your items into our truck and dispose of them accordingly. It’s that simple. You can sit back and relax while we take care of everything. We sort, bag, load and remove. Your Trash Doctor team is always professional, uniformed and friendly. We will always donate, recycle or reuse your items within the local community when possible. All labor work, loading, transport and disposal cost are included with your free estimate. Priority Service: The Trash Doctor can provide same day service and priority service for when you need your junk to disappear quick!